I set up this blog (courtesy of the Association of Liberal Democrat Councillors) when I became councillor for Cadoxton in 2008. Times move on, and the party’s candidate for the ward in the council elections soon to be upon us is Sheila Kingston-Jones. She is already well known to many people in Cadoxton, but to those of you in the village who still read this blog, I can tell you that Sheila is caring, enthusiastic, hard-working and would be an excellent councillor for Cadoxton. Sheila is also a resident of the same parliamentary constituency of Neath, unlike the current incumbent. 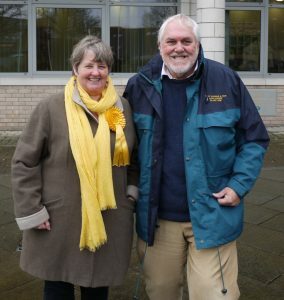 Sheila is pictured here with senior Liberal Democrat and former mayor of the county borough, Keith Davies.